Arsene Wenger was named coach of the decade as part of annual polling by the IFFHS (La Fédération Internationale de l'Histoire du Football et des Statistiques). And while all Gooners would all agree that Arsene really does Know, does his final position above Sir Alex and Mourinho mean he is better than two coaches who have won the European Cup twice? For me I would have to say yes, simply because of the legacy already enshrined at the Emirates. While the media constantly trot out just how long it’s been since we won a trophy (btw is this getting as annoying as how many red cards have been shown during his reign, or is that just me? ), Arsene has had the complete and total support of the club’s board. That stability has proved crucial in nurturing the careers of the likes of Cesc Fabregas and more recently Jack Wilshire. During the last decade Arsenal moved from Highbury, moved training grounds, moved into the next level financially, welcomed new signings and waved goodbye to old faces – but there has always been a constant, that of Arsene Wenger. Would he have had the time anywhere else to build a club, maybe Man Utd but certainly not at the likes of Chelsea and Manchester City. While Fergie and Mourinho have won trophies, they have spent a lot of money and not built the foundations as Wenger did. You only have to look back to 1996 when this unknown professor walked into Highbury – once people realised he wasn’t looking for Islington College and wanted to talk football then we all listened and the revolution truly began. The clouds over Highbury created by the George Graham controversy and Bruce Rioch’s tenure lifted and trophies littered the place. But while he spent money in the early days it was always in areas needed, if there was a player talented enough in one position he would let them flourish, think Ashley Cole, Ray Parlour and latterly Kieran Gibbs. While many dismiss him as frugal now, Arsene knows that around the corner is a bountiful harvest for the Arsenal, a club with no debt and a huge income which will mean it can compete for some of the world’s best – of course only if needed. 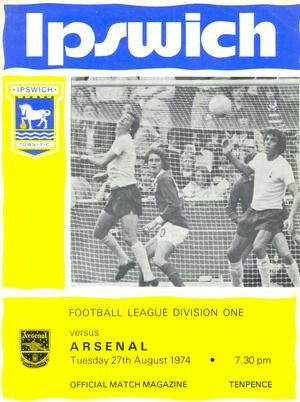 Arsenal vs. Ipswich is a game Arsenal should really be winning however it is precisely these types of games that Arsenal tend to struggle in. A tricky away tie to a physical Championship team probably wouldn’t be Wenger’s preferred game but with silverware in sight it is a game he must take seriously. A worry for Arsene will be the fitness of his centre backs with Vermaelen’s on-going injury problems still posing an issue and the recent hamstring injury of Squillaci during the 1-1 draw with Leeds in the FA Cup, another game that arsenal should have really won on paper. Having said that though, Wenger is lucky that the only 2 fit centre backs he has are the ones that have yielded him the best defensive results this season, the emergence of Djourou this season is reminiscent of song’s development a couple of seasons ago which has established him as a 1st team regular, whilst Koscielny seems to be improving game to game since the victory against Chelsea. Wenger is one centre back injury away from doubling his January shopping list after already admitting he will be looking to bring in a new face after the loss of Squillaci. The Ipswich game should also be a great opportunity for Arshavin and Chamakh to find their goal scoring feet again in light of their recent dips in form should Wenger go for a more experienced line up. Walcott’s post-match comments against Leeds, albeit very honourable, may work against him rather than for him. We saw how Eduardo’s dive against Celtic last year affected his penalty claims and every gunner will have their fingers crossed that Walcott’s honesty won’t come back to haunt him. Wenger may also call upon Bendtner whose height and physical presence may edge him in front of Robin van Persie, especially with Wenger’s habit to rotate in the cup. Martin Atkinson will be officiating the game, who has awarded the most penalties in the league this season as well as dishing out the most red cards. But with Walcott’s post-match interview honesty being highlighted by the media could this mean that Atkinson will specifically watch out for Walcott’s ability to stay on his feet or does it mean that Walcott will continue to hit the deck regularly? Arsenal staggered into the draw the 4th Round of the FA Cup after scraping a draw with Leeds United in a nerve shredding affair at The Emirates. The Gunners failed to heed the lessons learned by Manchester United at this stage of the competition last season, and were rescued from an embarrassing defeat by a combination of Cesc Fabregas & Theo Walcott being summoned from the bench in the second-half. The Leeds support packed the Clock End of the stadium, bringing with them the biggest volume of away support in The Emirates short history. And they were happy to let everyone in the ground and the watching television audience know about it. They cheered throughout, turning the Clock End into a Yorkshire stronghold for the day. As excepted, Arsenal rested many of their regular starting XI. Fabregas & Walcott were on the bench while Robin Van Perise & Samir Nasri were given the afternoon off. However, this was a line-up that looked more than good enough to win against most Premier League opposition, let alone a side from the Championship. But talent only produces when it is allied with the right attitude. Maybe it was the swirling wind, maybe it was the early start, the ostensible weakness of the opposition or a combination of all three. But what was clear is that many of the Arsenal players assumed that they could roll over Leeds without breaking sweat. Passes constantly went awry, the tempo was stagnant, as was their movement off-the-ball. Leeds had shown against both Manchester United and Tottenham last season that they are a resilient team won't gift you anything. If you want to beat them, then you have to do it on your own steam. Bar one incsive pass from Tomas Rosicky that played Andrey Arshavin clear, Arsenal offered little. Arshavin's tame one-on-one finish summed up Arsenal's play in the first-half. Sebastian Squillaci also had a header cleared off the line, but a lead at the break would have been more than Arsenal deserved. And with a bit more belief, maybe Leeds could have had a half-time lead of their own. While their defending was admirable, they often resorted to playing fruitless long balls for the tireless Luciano Becchio to chase. It was like watching Manchester City from Wednesday night all over again, which is a pity as given the proud footballing tradition of Leeds, I expected them to be more progressive when on the ball. The only glimpse of quality was when the ever dangerous Robert Snodgrass proved whatever Rosicky could do, he could match by playing Becchio in on goal with a well weighted pass. Goalkeeper Wojech Szczesny (who had an immaculate game) denied the Italian as he rushed off his line and closed down the angle, making a good save. Arsenal began the second-half playing at an increased tempo, but their passing remained lacklustre. Players constantly kept choosing to pass when they should dribble, dribble when they should pass, doing nothing when they should have been doing something. The worst culprit was Arshavin, who had the worst game I've ever seen him have in an Arsenal shirt. With every mistake he made, the louder the howls of frustration from the crowd were. The criticism from the stands grew ever more vitriolic, and I can only assume the reason Arsene Wenger didn't substitute him was because of the vicious reception he would have received from his own support when leaving the pitch. Whatever the reason, his confidence looks completely shot and he twice ran to the side of the pitch, assuming that he would be the player to be sacrificed for Walcott's arrival, and then Carlos Vela's. Just as the game was beginning to drift into a soporific stupor, it was brought to life by a goal for Leeds. The exciting but inconsistent Max Gradel was given too much space on the left-hand side of the penalty area, and committed Denilson into a challenge. The Brazilian foolishly stuck his leg out and brought Gradel down. Referee Phil Dowd immediately pointed to the spot and Snodgrass fired the penalty home underneath Szczesny's wrist to send the away support into hysterics. Arsenal looked dazed. Shell-shocked. They were about to become the latest to fall by the wayside to Leeds FA Cup exploits. A rescue job was required and Wenger knew it. Fabregas was summoned from the bench and with his first two touches injected more pace into Arsenal's play, resulting in a corner. His mentality spoke volumes and raised the spirits of the crowd and his players. It was like he was running around the pitch with a neon sign that said "Give me the ball!" But it seemed that even Fabregas's efforts would come to naught. Even a superhero needs a sidekick and he was soon joined on the pitch by Walcott. Up to this point it looked as if Leeds would hold out to cause the shock of the 3rd Round. But Walcott's sheer pace put a crucial seed of doubt in the minds of their players. For the first time in the game, nerves seemed to affect them, their defence dropping ever deeper, worried about Walcott racing in behind them. As the game reached the 88th minute, the game sparked into life. Walcott was played clear on goal but opted to take the shot early rather than set himself first. It was a tame sidefooted effort and Kasper Schmeichel saved easily. A minute later, the England winger broke free in the inside-right channel. After escaping the attentions on Ben Parker, Alex Bruce made a desperate covering challenge. Walcott went down and the referee pointed to the spot. Or did he? As celebrations engulfed the Arsenal fans, the referee seemed to change his mind. Bewilderment rung around the stadium and Leeds were given a free-kick as Walcott was adjudged to be offside. But he and Arsenal were not done. Walcott broke clear of Parker again. The Leeds defender tugged at Walcott's shirt, unbalancing him. This time a penalty was awarded. Curiously enough, Walcott later claimed he dived to win the aforementioned spot-kick but from my seat in the ground, it looked an obvious foul. But that's by the by. The 90 minutes were now up, and Cesc Fabregas had a golden opportunity to keep Arsenal in the competition. It's fair to say that most neutrals would have wanted Leeds to hang on. The FA Cup is made for giant-killing stories such as this and the only thing that could have rounded it off would be for Schmeichel to keep the spot-kick out. But Fabregas isn't the type to fo along with a pre-ordained narrative, not when he can write one of his own. He showed tremendous courage to place his shot down the middle of the net, gambling on Schmeichel diving to the corner of the net. But if the penalty was telling, his celebration was even more so. While he ran to the crowd and pumped his arms in delight and relief, his teammates all turned their backs and walked back to the centre circle. It didn't seem an act of shunning, more an embarrassed acknowledgement that once again they needed their lynchpin to save them from a quandary that they never should have got themselves into. While the other ten players looked sheepish, Fabregas stood a man apart, a class above, Arsenal's superman. And the drama wasn't done there. As we approached injury time, Fabregas played Nicolas Bendtner clear with a sumptuous pass. Bendtner had already missed two great headed chances in the second-half, but he saved the worst for last, shinning the ball horribly wide of the goal. In scenes reminiscent of Wednesday night, Denilson then hit a fierce effort from outside the box. As the ball left his boot, it looked for all the world like it was going to nestle in the far corner. But Schmeichel produced a top class save to keep the score at 1-1. In the dying seconds Walcott hit the side netting from a tight angle. The whistle went soon after and both sets of fans applauded their players at the end of a compelling FA Cup tie. While Arsenal created enough chances in the last five minutes to win three games, a defeat for Leeds would have been harsh. They defended manfully, with Bruce & Andy O'Brien impressing. And while they offered a minimal attacking threat, Snodgrass looks Premier League quality and only a fine save from Szczesny stopped Becchio from making it 2-0 in the second-half. Their fans were also a credit to the club, raucous without being provocative, passionate without being abusive. It only seems a matter of time before we see them back in the top flight again. As for Arsenal, they now face a replay that could be tough. Elland Road will be packed to the rafters and with a demanding fixture list on the way, Wenger faces a dilemma whether to give his fringe players a chance to make amends or risk tiring out his key men to gain a place in the 4th Round. But regardless of the team he picks, if they perform like this again, then Leeds are sure to beat them on Wednesday week. Cesc Fabregas - Once again he performed a rescue job when Arsenal needed him. While Arsenal may lack the right mentality on occasion, the accusation that the club suffer from lack of leadership is absurd. He is as inspirational to Arsenal as Steven Gerrard is for Liverpool or John Terry for Chelsea. Arsene Wenger will welcome back three heavy hitters for Saturday’s clash with Birmingham at St. Andrew’s. Alex Song, Cesc Fabregas and Robin van Persie are all set to be included in the squad after being rested, or in Fabregas’ case suspended, for the two-all draw at Wigan during midweek. Similar problems have been the thorn of the Arsenal team in recent years, even when the likes of Kolo Toure and William Gallas were first-choice defenders. Some fans will be calling for Johan Djourou’s inclusion for the Birmingham game, after his composed, strong and telling performance against Chelsea and Didier Drogba on Monday night. It was perhaps a surprise that Squillaci was chosen ahead of the Swiss international for the Wigan match, a decision by Wenger which ultimately lost two points for the team. Squillaci cannot be blamed alone however. Koscielny and Emmanuel Eboue on the left hand side looked shaky throughout, and were given a troublesome time by Charles N’Zogbia, until the rush of blood which earned him a red card and relief for the back-line. The defence chosen by Wenger for tomorrow may well be based on his counterpart’s choices up front. Johan Djourou could be the perfect foil for Cameron Jerome’s pace or Nikola Zigic’s heading ability, whilst the constant threat of Kevin Phillips’ knack of scoring out of nothing, as he did late on in last year’s reverse fixture, should be taken into account. Gael Clichy is likely to return ahead of Eboue at left-back. Eboue may, however, battle with Bacary Sagna for the right-hand side slot, although the latter appears to have rediscovered his form, showing his defensive experience on many occasions on Wednesday. It will be as much a mental test as a physical one for the back-line on Saturday. Birmingham are notoriously hard to beat at home; 14 of their 19 points this season have come at their own ground, with only one loss there so far. Furthermore, City seem to have an ability to ‘up their game’ when hosting the top sides; not one of the ‘top six’ has beaten them at St. Andrew’s for 18 months, a record Arsenal will need to break if they do not want to receive similar criticism as before the Chelsea game. Alex Song’s inclusion should add much-needed strength and defensive nouse, which was missing from Wednesday night’s line-up. Also, his improved goal tally, with 4 goals in the League already this season, increases the probability of Arsenal’s many attacking moves being finished off. Both Arsenal goals in midweek came almost immediately after Jack Wilshere’s inclusion from the bench, and fans will be hopeful of another start for the ever-improving English young gun. The injury to a seemingly sluggish Abou Diaby during the first-half to allow for Wilshere’s participation suggests the Frenchman’s return came too early. The calf strain he picked up will see him out for around a further three weeks. Arsenal will need to rely on the technical abilities of both Wilshere and Fabregas in midfield tomorrow. Denilson is also available and may be chosen ahead of either of the two, his short passing controlling the flow of the midfield. However, against a hugely organised Birmingham defence, the Gunners may need invention from the midfielders to break the team down, suggesting only a place on the bench for the Brazilian. With the return of Robin van Persie, the spark into life from Andrey Arshavin for the two goals on Wednesday night, and Theo Walcott’s clinical involvement against Chelsea before that, Wenger will have a headache in deciding his attacking five. Marouane Chamakh and Nicklas Bendtner both have a claim for the central role, and it would seem height is a necessity against the centre-back pairing of Scott Dann and Roger Johnson on Saturday. Tomorrow is all about a return to form for Arsenal, and more assurance from the back-line. If the team can lay successful defensive foundations, the vast array of attacking talent on offer should be able to get past Birmingham by one or two goals. The Gunners will need to be wary of the threat of Birmingham’s all-round abilities up front, as well as Lee Bowyer’s late arrivals in the penalty area, and will need to remain composed throughout. If they can do that, any combination of players in the forward positions should earn Arsenal a much-needed away win.